I got this app when I had my baby and intended to use it for her. And now, five years later I’m still using it...for myself to fall asleep at night. It’s an awesome app. Love the “car ride” setting! Awesome! Love the "Cry Detection" feature! Cry detection option is amazing! Baby cries... Noise comes on... Baby falls back to sleep! I use it every night as a noise machine. 50 years old and I’m apparently regressing. Your app has me sleeping like a baby. I’ve used this app ever since my son was an infant and he just turned three. So many different noise choices to choose from that it gives you just about everything you could ever think of. And he sleeps wonderfully! I use it too when I can’t sleep. Gray noise all the way for our family! This works great to keep the baby asleep through all noises and the night, I've used with both of my kids and works wonderful. Been using this app for years I prefer pink noise and I’ve never had any issues. I have trouble sleeping, especially when I’m staying elsewhere this app helps my brain ignore snoring, other noises and I sleep better! Baby wouldn’t let us put him down... throwing the sleep sack in the dryer and playing this apps “Mom’s Heartbeat” sound did the trick INSTANTLY. Total game changer. I use this app every single night for myself. Not just for babies. 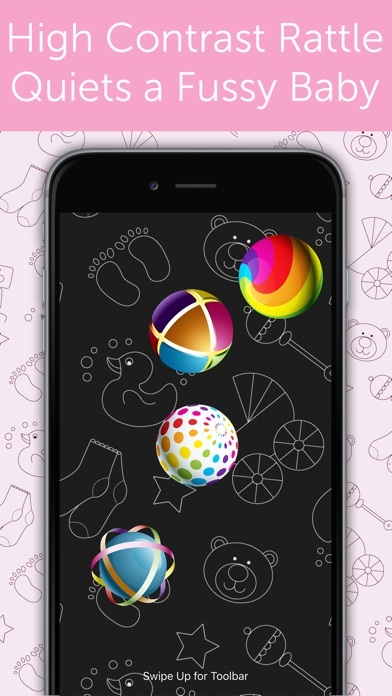 I found this app when my daughter was about 1 she is 6 now, and I use it for my youngest and myself. I love the sounds available and how portable it is. I LOVE this app! Perfect white noise to fall asleep to!! I’m 37 and I love this app to help me sleep when I’m away from home! It’s the best one I’ve found. I’m in the army so I’m away a lot. And this app really helps me knock out fast in the barracks!! I’m a newborn photographer and the pink noise is the BEST for keeping babies sleepy! I also love the fan for when we are out of town and need noise. 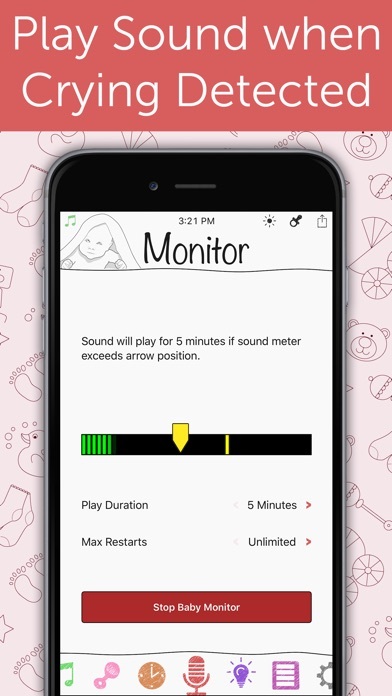 Seriously one of the best sound machine apps out there, haven’t found a better one yet-best thing is I always have one with me to block out noise so my baby can sleep better! Better sleep for baby means better sleep for mama! Thank you so much for helping my baby & family sleep. We've been using this app for 2 years and absolutely love it. The car ride sound is so perfect and ambient without any distracting sounds that other apps have. Thanks for making it simple and wonderful! Love this app, super convenient having it on my phone I can just stick it near baby.... I can take it anywhere! And I love all the different options too! Our 6 months old son cannot stop crying even there is a pacifier in his mouth and I have decided to download this app and use "car ride" sounds.... Bam! He fall asleep in 3 mins! Lifesaver! Will always use this app! Thank you! So helpful with new baby! Not a fan of latest version. Not too happy with the latest version. The previous UI was perfectly fine and I'm not sure why it changed. I can get past that though, it's the fact that they removed the red noise sound that annoys me the most. We've been using that sound for over two years now and it was taken away in the current version which seems silly to have removed sounds for no reason. My baby's choice is hair dryer, what's yours? I absolutely love this app and recommend it to all new moms that are constantly on the go, like myself. When ever my baby starts to get a little fussy, I put the rattle on and give it to him and he easily quiets. When it comes to bedtime, we do a bath, feeding, and put him in his crib with the white noise and he is out within minutes. While we're in the car, sometimes I put on the music side. Such a great app. Turn on any one of the white noise sounds calms right away. Definitely helped us get our kids to sleep. My LO is 5 weeks right now, I can play vacuum and he settles almost instantly! LOVE this app, recommended to my by a fellow mommy. Saved me quite a few times from the screams of a very unhappy child. Love it! Helps baby fall asleep and sleep well. Great for babies AND adults! Our favorite is conch shell! I use it to sleep every night. It's awesome! This app is amazing! Buy it now before you're in a bind and you'll be thankful later. We use this app every single day to help our little guy sleep. It is great!! LOVE this app. There are so many options for white noise, and the music selections are beautiful and peaceful. Love how simple it is and that it still plays in the background! Great sleeping aid for fussy babies! Combine with the 5S technique from Happiest Baby on the Block and you'll calm down baby every time! When you're sleep deprived and your baby is too you'll be so thankful that you chose to get this app. I feel like I should pay a finders fee to the friend who recommended it to me as well! This app is a must .! Best .99 cents I think I've ever spent .! My daughter has colic and sleeps so much better with this app.! My LO is 5 weeks & it has helped us with transitioning from our room into hers! I'm glad my aunt suggested for me to download it. This app has helped my daughter go to sleep at every nap time and bedtime. I put her in her bassinet and have this on nearby and she knows it's time to close her eyes. She is 7 weeks old and it has worked since week one! Puts my baby to sleep, she passes out quick! I use this frequently to help calm our newborn. Baby loves it. I like the different types of white noise. Our 3 month old baby loves this app... Especially the "red noise" and the classical music. Thanks for making it! White noise is perfect pitch for baby to sleep! Great great great amazing amazing amazing life saver of an app. This is great app, I have other apps and they don’t allowed continuous sounds. There’s a limit of 1 hr. This app goes on all night. My baby loves the fan sound. I’m just wondering how does the baby monitor option works? I have the app downloaded on both iPhone 4 and iPhone 6, do they sync? Just curious how that works so I can start using it. Developer can you please explain? Thanks! My baby can’t sleep without it. My son is 10 Weeks and I have been using this app with him since he came from the hospital. He won’t sleep without. It’s such a benefit for me and my sleep and my insanity. We absolutely love it. I've used this with both my kids and the "blue noise" always soothes them to sleep! Please. Bring Red Noice back. I love this app, It calms baby and puts her to sleep. Love the versatility, sound quality, and price. We use the app several times a time and at night. Our son hates to sleep, he fights his sleep at nap time and at bed time. But with this app it has made it so much easier for us!! This app helps me to fall sleep! My 2 year loves this app! I've used this app for the last couple of years to help me sleep. I travel a lot and it is so helpful to have an app on my phone that has exactly the white noise I need to drown out all the other random noises. I love this app. I have slept to it for years now. Works perfectly and ground sounds options. Vacation noise probs got you down? This is your app. Or, lack of white noise keeping you awake? This is for you. Lots of different sound options and doesn't sap my iPhone battery even when running all night. Has been a sleep saver on dozens of occasions in the past few years. My son Had colic when he was a baby, and this app was a lifesaver. It would calm him so much. Originally downloaded for my baby when she was younger and now I can't sleep without it! Love it!! Worked wonders for my little one! I have 7 grandkids and this app earned me the title of baby whisperer! The youngest is asleep on me now thanks to her fav, the hairdryer! I really have no complaints. Has helped when my three kids each were going to bed. Also helped when my white noise machine broke and I needed a temporary solution. The best noise is car ride by far. My babies are now 13 and 16. I use this app for myself when it's too quiet or when the birds start chirping at 5am. Wonderful! Our daughter is soothed instantly by the Doppler sound offered in this app. Use it for my baby everyday! I love this app. I use the lullabies every night in our bedtime routine and use the white noise sounds while she sleeps. I love that it's on my phone so I can also use it in the car when she is fussy and it helps calm her down quick. I've downloaded it on multiple devices so I will always have it with me. Also, if I put my phone on silent, I can play it as loud as it will go and all my phone calls and text messages still stay silent. This app is amazing. I bought it not knowing it also had classical music to play. Turns out my baby sleeps best to Chopin! This is so amazing I use it every single time I need to go to sleep and it works like a charm every time I'm sacked out in like 10 minutes!! Love this app! We use it everywhere we go! Great for noisy hotels! I've been using this for every sleep time for baby. It drowns out the noise of daily home life. I can't sleep with out it myself.